The Wooler Wheel Classic Cycle Sportive will be 5 years old in October and to celebrate their event on October 1st 2016 will raise money for MS Research and Relief Fund (MSRRF). 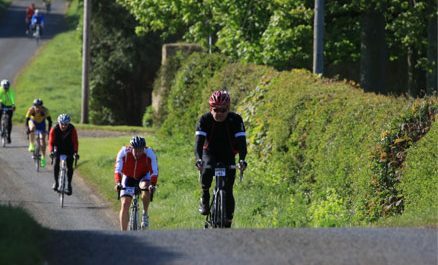 The Classic Cycle Sportive takes place on October 1st and offers two distances – 100km and 50km making it ideal for experienced riders and those attempting their first Sportif. Unlike some other events this is not a race and riders can complete the ride at their own pace. Both routes are well signed and marshals are located at regular points along the route ensuring everyone is well looked after. Riders on the last Wooler Wheel Cycle Sportive on Saturday May 14th when over 500 riders took taking and raised money for the Great North Air Ambulance Blood on Board Project. Starting and finishing in Wooler, Gateway to The Cheviots, The Wooler Wheel Classic takes you on a circular tour through stunning scenery and challenging climbs. The Classic event, which started in 2012, takes place in October each year and offers two different distances. Whichever you choose you are guaranteed a great time and, if the weather is good to us, some spectacular views of the North Northumberland countryside. A cycle ride to be remembered as you ride through 8,000 years of history within the beautiful countryside around Glendale, North Northumberland. And if you can to look at more than the tarmac along the routes are the fantastic views of the beautiful countryside around Wooler. Wooler Wheel organiser, Janet Pibworth says “The Classic is still a firm favourite with many riders and has becomes a regular fixture in many diaries. We are expecting around 500 riders so everyone who takes part will certainly feel that they’ve taken part in a real team effort to raise money for charity. The Classic is a great introduction for those doing their first Sportif and for experienced and elite cyclists it is still a demanding rides making a perfect way to wind down the season”. The cycle event on October 1st will raise money for MS Research and Relief Fund (MSRRF) a UK registered charity established in 1964 which provides a range of services to people whose lives have been affected by multiple sclerosis (MS). Based in Morpeth they provide services and support across the North East including Northumberland. The Wooler Wheel is once again fortunate to have the support of Harrison & Hetherington who own H&H Wooler Auction Mart, which provides an ideal base for the cycle events. Other supporters include Northumberland National Park, Edinburgh Bicycle Co-operative, the Great Northumberland Bread Company and Farm to Freeze. The Classic Cycle Sportif first took place in 2012 and has become a regular date for riders. So what could be a better way of spending a Saturday than getting fit, having fun and raising money for charity. With the two Classic rides on offer whichever you choose you are guaranteed a great time. Feed and water stations provide sustenance including flapjacks, jelly babies and bananas. And when you’ve finished a sit down and a hot meal await, and, as one rider said “it’s worth doing the ride just for the steak pie and mushy peas”. So get your bikes in order and make sure your gears work properly as both distances have some challenges from the first hill at Weetwood just a few miles from the start to the ascent at Lyham Bank and for those riding the 100km there’s Flodden Edge. And don’t worry if you do get mechanical problems as we have a Controller on duty all day and we have Edinburgh Bicycle Co-operative on hand – and there’s very few problems they can’t fix. So come and join us and help raise money for a really worthwhile cause. And if cycling isn’t really your thing but you’d like to help with the event you could come and join our band of marshals on the day itself. They give up their time, whatever the weather, to help the event go smoothly either by helping at the Mart itself or out on the route.